We borrowed this healthy and fresh recipe from our very good friend Jennifer Ferrell TV host and lifestyle expert, it was so delicious we had to hit it with some HEPP'S and share it too!! Check out Jennifer's blog at http://jensome.blogspot.com/ for other DIY design ideas and lifestyle advise. Chop avocado into small bite-size chunks. Layer torn basil leaves first, then top with mozzarella, avocado, and roasted tomatoes. 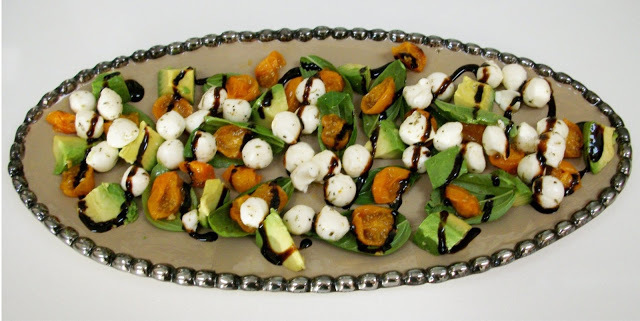 Drizzle with balsamic glaze and add a sprinkle of HEPP'S Aussie Flake Sea Salt & pepper. Optional to drizzle with olive oil as finishing touch. find these and many others at www.heppssalt.com or at our farmers market locations.